CEO for Bighorn Valley Health Center. He received his medical degree from Harvard Medical School. A practioner at the Hardin Clinic, Dr. Quanbeck graduated from University of North Dakota School of Medicine in 2007. She completed her residency at Billings Montana Family Medicine Residency in 2010. 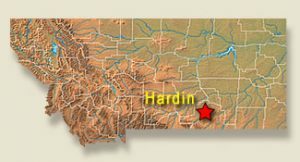 She started in Hardin in 2010. Clinic: St. Vincent Physician Network (Hardin Clinic) is dedicated to providing the highest quality healthcare to every member of our community. Our provider team is comprised of family practice physicians and a physician’s assistant. Providing quality, hometown care is a priority of our providers and we see over 19,000 patients each year. Our team takes time to know you and your family, to answer any questions you may have regarding your care and coordinates specialized care if it is needed.. Nursing Home: Part of Big Horn County Memorial Hospital, Heritage Acres Nursing Home complex includes long term care beds and assisted living and independent living apartments. Students will work with Hardin Clinic physicians for majority of family medicine experience, including OB, psych, chronic care, and peds patients. Will work at Big Horn Valley Health Health Center for internal medicine. Daily rounding at hospital will occur with preceptor and other providers. Surgery is possible and is covered by the FM physicians. ER work is with mid-levels, with physicians providing back-up coverage.Areas of interest in and around the community: Little Big Horn Battlefield National Monument (“Custer’s Last Stand”) and Big Horn County Historical Museum. Outdoor recreation abounds and includes hunting, fishing, and hiking in the surrounding rugged landscape. Of particular interest is the Big Horn Canyon National Recreation Area. Hardin is 50 miles east of Billings. To see a map of where we are located and/or get directions from other locations, go to Google Maps. Hardin has a semi-arid climate with windy cold “dry” winters and hot, wetter summers.